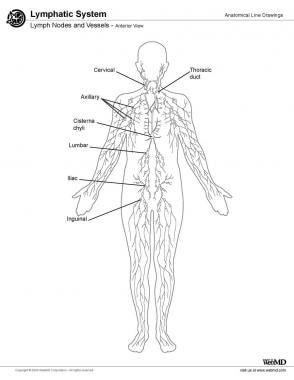 The lymphatic system parallels the cardiovascular system (see the images below). The lymphatic system is unique, in that it is a 1-way system that returns lymph fluid via vessels to the cardiovascular system for eventual elimination of toxic byproducts by end organs, such as the kidney, liver, colon, skin, and lungs. Lymph is a fluid derived from blood plasma. It is pushed out through the capillary wall by pressure exerted by the heart or by osmotic pressure at the cellular level. Lymph contains nutrients, oxygen, and hormones, as well as toxins and cellular waste products generated by the cells. As the interstitial fluid accumulates, it is picked up and removed by lymphatic vessels that pass through lymph nodes, which return the fluid to the venous system. As the lymph passes through the lymph nodes, lymphocytes and monocytes enter it. Lymphatic capillaries are blind-ended tubes with thin endothelial walls (only a single cell in thickness). 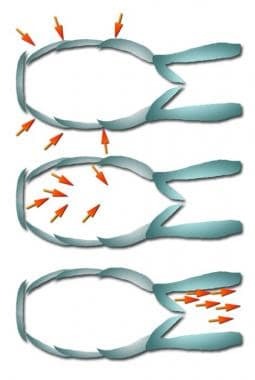 They are arranged in an overlapping pattern, so that pressure from the surrounding capillary forces at these cells allows fluid to enter the capillary (see the image below). The lymphatic capillaries coalesce to form larger meshlike networks of tubes that are located deeper in the body; these are known as lymphatic vessels. 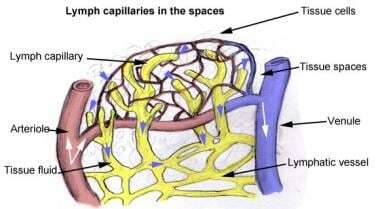 Lymph capillaries in spaces. Blind-ended lymphatic capillaries arise within interstitial spaces of cells near arterioles and venules. 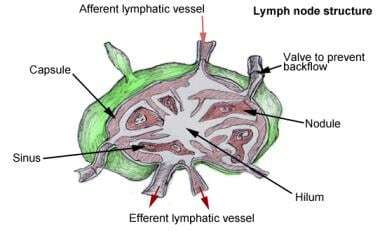 Lymph nodes are bean-shaped structures that are widely distributed throughout the lymphatic pathway, providing a filtration mechanism for the lymph before it rejoins the blood stream. The average human body contains approximately 600-700 of them, predominantly concentrated in the neck, axillae, groin, thoracic mediastinum, and mesenteries of the GI tract. Lymph nodes constitute a main line of defense by hosting 2 types of immunoprotective cell lines, T lymphocytes and B lymphocytes. Lymph nodes have 2 distinct regions, the cortex and the medulla. The cortex contains follicles, which are collections of lymphocytes. At the center of the follicles is an area called germinal centers that predominantly host B-lymphocytes while the remaining cells of the cortex are T-lymphocytes. Vessels entering the lymph nodes are called afferent lymphatic vessels and, likewise, those exiting are called efferent lymphatic vessels (see the image below). Extending from the collagenous capsule inward throughout the lymph node are connective tissue trabeculae that incompletely divide the space into compartments. Deep in the node, in the medullary portion, the trabeculae divide repeatedly and blend into the connective tissue of the hilum of the node. Thus the capsule, the trabeculae, and the hilum make up the framework of the node. Within this framework, a delicate arrangement of connective tissue forms the lymph sinuses, within which lymph and free lymphoid elements circulate. Lymph drainage flow; lymphatic duct anatomy. The thymus is a bilobed lymphoid organ located in the superior mediastinum of the thorax, posterior to the sternum. After puberty, it begins to decrease in size; it is small and fatty in adults after degeneration. The spleen, the largest lymphatic organ, is a convex lymphoid structure located below the diaphragm and behind the stomach. It is surrounded by a connective tissue capsule that extends inward to divide the organ into lobules consisting of cells, small blood vessels, and 2 types of tissue known as red and white pulp. Red pulp consists of venous sinuses filled with blood and cords of lymphocytes and macrophages; white pulp is lymphatic tissue consisting of lymphocytes around the arteries. Lymphocytes are densely packed within the cortex of the spleen. Tonsils are aggregates of lymph node tissue located under the epithelial lining of the oral and pharyngeal areas. The main areas are the palatine tonsils (on the sides of the oropharynx), the pharyngeal tonsils (on the roof of the nasopharynx; also known as adenoids), and the lingual tonsils (on the base of the posterior surface of the tongue). 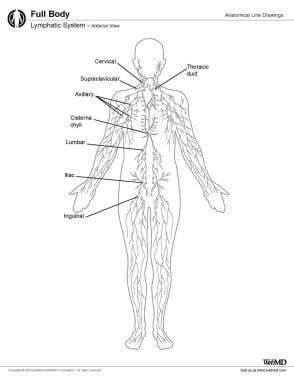 Diseases of the lymphatic system include lymphedema, lymphoma, lymphadenopathy, lymphadenitis, filariasis, splenomegaly, and tonsillitis. Lymphedema results when the lymphatic system cannot adequately drain lymph, resulting in an accumulation of fluid that causes swelling. It may be either primary or secondary. Splenomegaly, or enlarged spleen, is a lymphatic system disorder that develops as a result of a viral infection, such as mononucleosis. Alcamo E, Krumhardt B. Anatomy & Physiology. The Easy Way. Barron's; 2005. Marieb E, Hoehn K. Human Anatomy & Physiology. 8th. 2010. Molander DW. Diseases of the Lymphatic system- Diagnosis and Therapy. 1983. Kindt TJ, Goldsby RA, Osborne BA, Kuby J. Kuby Immunology. 2007. Klein E. Anatomy of Lymphatic system. 2010. Saunders WH, Wakely P. Atlas of Head and Neck Pathology Lymph nodes and Lymphatics, Dept of ENT-Ohio Medical School. Available at http://ent.osu.edu/atlas-head-and-neck-pathology/. Brotons ML, Bolca C, Fréchette E, Deslauriers J. Anatomy and physiology of the thoracic lymphatic system. Thorac Surg Clin. 2012 May. 22(2):139-53. [Medline]. Boccardo F, De Cian F, Campisi CC, Molinari L, Spinaci S, Dessalvi S, et al. Surgical prevention and treatment of lymphedema after lymph node dissection in patients with cutaneous melanoma. Lymphology. 2013 Mar. 46(1):20-6. [Medline]. Rockson SG. The unique biology of lymphatic edema. Lymphat Res Biol. 2009. 7(2):97-100. [Medline].